University of Nebraska Press, 9780803284371, 210pp. Pushing back against the contemporary myth that freedom from oppression is freedom of choice, Frank Ruda resuscitates a fundamental lesson from the history of philosophical rationalism: a proper concept of freedom can arise only from a defense of absolute necessity, utter determinism, and predestination. Abolishing Freedom demonstrates how the greatest philosophers of the rationalist tradition and even their theological predecessors—Luther, Descartes, Kant, Hegel, Freud—defended not only freedom but also predestination and divine providence. By systematically investigating this mostly overlooked and seemingly paradoxical fact, Ruda demonstrates how real freedom conceptually presupposes the assumption that the worst has always already happened; in short, fatalism. 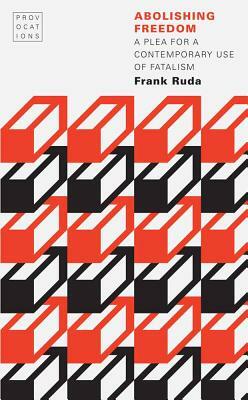 In this brisk and witty interrogation of freedom, Ruda argues that only rationalist fatalism can cure the contemporary sickness whose paradoxical name today is freedom. Frank Ruda is an interim professor for the philosophy of audiovisual media at the Bauhaus University in Weimar, Germany, and a visiting lecturer at Slovenian Academy of Sciences and Arts. He is the author of Hegel’s Rabble: An Investigation into Hegel’s Philosophy of Right and For Badiou: Idealism without Idealism.